There is a place, an actual system within your consciousness where logic and infinite potential merge to create a greater reality filled with attainable possibilities. 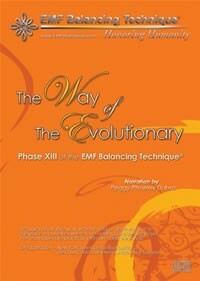 The Phase XIII session is a grand combination of all twelve phases of the EMF Balancing Technique. We are living in a time of great change, personally and collectively. This time of transformation presents us with a golden opportunity to evolve beyond our current limits. If we keep doing the things we have always done, we will continue to create the same results. Do you choose to embrace your evolutionary process, or do you choose to remain the same? This session is the Alpha and the Omega, the beginning and the end point of this evolutionary body of work that is practiced all around the world. Your thoughts, words, actions, and emotions create the energy charges that determine the patterns of your life. In wisdom and joy, take charge of your reality and you may find yourself smiling even more! With this CD you can experience the Phase XIII at any place and time! Peggy Phoenix Dubro is a distinguished international speaker and teacher whose diverse talents have gained her a worldwide presence in the arena of “new thinking”. Over a period of twenty-two years, she has developed the EMF Balancing Technique®, an elegant and sophisticated form of energy work that is now practiced in more than 70 countries. Documented benefits from working with the EMF sessions include profound peace, stress-reduction, mental clarity, increased vitality and rejuvenation, physical regeneration, greater mastery in one’s life, improved relationships and overall well-being. The range of benefits is unlimited as we learn to hold and express our greater charge. She is also the discoverer of the Universal Calibration Lattice®, an organized system of energy extending beyond the physical body that is your personal link to the universal energy source. In partnership with her husband Stephen, she is co-founder of The Energy Extension, Inc., an international organization dedicated to the conscious management of personal energy. They have also developed the LatticeLogic™ courses for school age children and forward thinking organizations. These new programs, based on quantum/circular reasoning combined with the power of focused intent, are being presented in secondary schools and various businesses around the world!